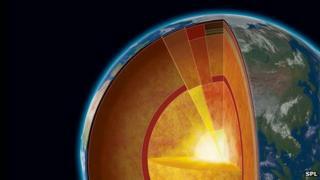 New measurements suggest the Earth's inner core is far hotter than prior experiments suggested, putting it at 6,000C - as hot as the Sun's surface. That has to be worked out either in computer models that simulate the Earth's insides, or in the laboratory. Measurements in the early 1990s of iron's "melting curves" - from which the core's temperature can be deduced - suggested a core temperature of about 5,000C. "It was just the beginning of these kinds of measurements so they made a first estimate... to constrain the temperature inside the Earth," said Agnes Dewaele of the French research agency CEA and a co-author of the new research. "Other people made other measurements and calculations with computers and nothing was in agreement. It was not good for our field that we didn't agree with each other," she told BBC News. The core temperature is crucial to a number of disciplines that study regions of our planet's interior that will never be accessed directly - guiding our understanding of everything from earthquakes to the Earth's magnetic field. "We have to give answers to geophysicists, seismologists, geodynamicists - they need some data to feed their computer models," Dr Dewaele said. The team has now revisited those 20-year-old measurements, making use of the European Synchrotron Radiation Facility - one of the world's most intense sources of X-rays. To replicate the enormous pressures at the core boundary - more than a million times the pressure at sea level - they used a device called a diamond anvil cell - essentially a tiny sample held between the points of two precision-machined synthetic diamonds. Once the team's iron samples were subjected to the high pressures and high temperatures using a laser, the scientists used X-ray beams to carry out "diffraction" - bouncing X-rays off the nuclei of the iron atoms and watching how the pattern changed as the iron changed from solid to liquid. Those diffraction patterns give more insight into partially molten states of iron, which the team believes were what the researchers were measuring in the first experiments. They suggest a core temperature of about 6,000C, give or take 500C - roughly that of the Sun's surface. But importantly, Dr Dewaele said, "now everything agrees".